Eleven people have been injured after a known psychiatric patient drove into pedestrians while allegedly shouting Islamic slogans in a French city. 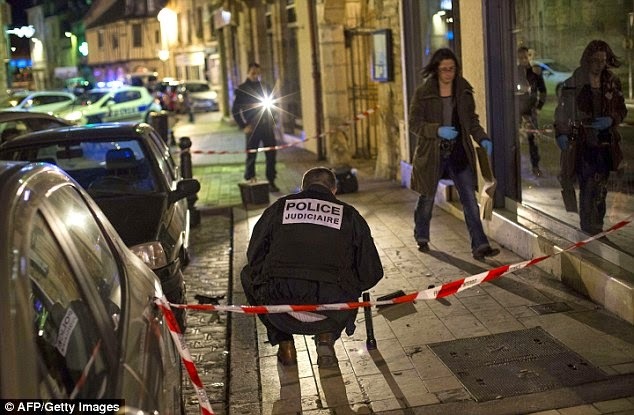 Two of those hit by the driver, who was believed to be drunk, were in a ‘very serious’ condition in the city of Dijon after being struck shortly after 8pm. ‘He ran over as many people as he could in a Renault Clio, and many are suffering with very serious head injuries,’ said a police source at the scene. Pictures showed the injured lying in the road around Place Wilson (Wilson Square), as emergency vehicles arrived to take them to local hospitals. The 40-year-old was known to police, and may have carried out a copycat attack based on terrorist related incidents in his home country, and in Australia. Interior Ministry spokesman Pierre-Henry Brandet confirmed that the man was a ‘psychiatric patient’ and used expressions including ‘Allahu Akbar’, or ‘God is Great’. He was also heard to say ‘For the Children of Palestine’, referring to deaths of more than 500 youngsters during the Israeli military campaign in the Gaza Strip over the summer. The driver was thought to be heading for a police station in Dijon, but only got as far as surrounding streets before his car was stopped.